THE "Garden of England" has always been associated with the culture of the hop, and a guide to one of the most typical of Kentish towns would be incomplete without some reference to this beautiful plant. As we walk along the verdant lanes around Tonbridge it is only right that we should enquire somewhat more minutely concerning the history and culture of the hop. First briefly let us hear what the botanist has to tell us about it. He says the "Hop (Humulus 1upulus) is a perennial dioecious plant of the natural order Cannabinaceae, the only species of its genus. It has long rough twining stems, and stalked three-five lobed rough leaves, and is a plant of luxuriant growth and abundant foliage. The male flowers grow in loose branching axillary panicles, and consist of five stamens surrounded by five-lobed perianth. The female flowers are in strobiles, or cones, with large, persistent, concave, entire scales, which enlarge as the fruit ripens. The part of the hop so much used in brewing, and sold under the name of hops, is the ripened cone of the female plant. Female plants alone, therefore, are cultivated to any considerable extent, it being enough if a few male plants are scattered over a field." Came into England all in one year"
Be that as it may, there is no question that in its early history in this country the introduction of its use in the manufacture of beer met with violent opposition, for in 1426 information was laid against a brewer for using "an unwholesome weed called hops," and long before the vexed questions of local veto, Sunday closing, grocers' licenses, and other matters of beery controversy had distracted the brains of our law makers, questions relating to beer had forced their way into our legislature, for shortly after the aforementioned date petitions were presented to Parliament against the use of "that wicked weed called hops." In 1524 a law was passed forbidding the use of hops, on the ground that they tended to "make people melancholy". The culture of hops went through the usual stages of opposition, being first violently opposed, then ignored, and finally recognised as part and parcel of our agricultural productions. The "melancholy" effects of this "wicked weed" can best be observed on a Bank Holiday evening in the vicinity of any popular pleasure resort. As regards the culture of the hop, it seems to have a kind of fascination for the Kentish agriculturist. Large fortunes have been amassed by its means, and equally large ones lost. No crop is so uncertain in its results. What may bid fair (after large amounts of money have been spent upon it) to be a large crop may just before hop picking commences all be spoilt by some of its many enemies, such as the mould, the fly, the louse, the rust, &c. In fact, the words of one who knew what hop growing was from personal experience sum up the whole matter. He says : "The crop is eminently of a wagering character. So delicate is the plant and capricious the climate, and uncertain the market, that they are kept (the growers) during the greater part of the year as much on the edge of expectation as if they were gambling with their whole income at stake." But for the present we are more concerned with the picturesque aspect of hop culture, and in this respect few sights are more beautiful than a hop garden towards the end of August, when the flowers, hanging in golden clusters, are approaching maturity, and the tall hop-poles are often bowing beneath their wealth of unique beauty. It is an especially beautiful sight to look down from the summit of a hill on to a prosperous hop garden in full flower. It is then, if the visitor be from the busy haunts of men, that he will realise the truth of the old lines that "God made the country, man made the town." Hopping in Kent—particularly at Tonbridge and the adjoining towns and villages – s the event of the year. Rich and poor alike have been building their hopes on what it is going to bring them. The former are hoping for a heavy crop and good prices – a combination which unfortunately seldom go together; the latter look forward to the "good time coming" to enable them to earn a little more money than usually falls to their share, and thus wipe off some of those outstanding scores "down town." But not only are the country folk building their hopes on hop-picking, but away in the slums of the East End of London mothers are anxiously scanning the wan faces of their little ones, and counting the weeks and days to the time when Bill and Tom and 'Liza, with father, mother, and their few household goods in the shape of bedding, saucepans, &c., will away to the Kentish hop gardens to recoup their health and earn what they can. Thousands of such families annually leave the metropolis, carried to the centres of the hop-picking districts in special cheap trains by the S.E.R. and L.C.D.R. respectively. From the West End, fashion's devotees may, in search of renewed health, make their way to Scotland or Homburg ; but it is a question whether a few weeks in a hop garden, picking the golden clusters from the poles, and inhaling the pungent tonic aroma, would not prove just as beneficial, and certainly much more economic. 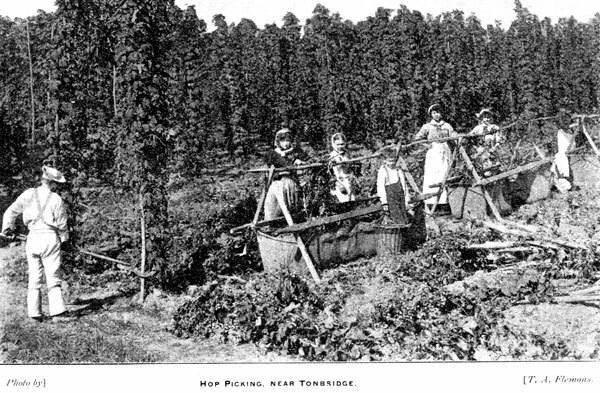 It is a grand sight when hopping is in full swing to walk from bin to bin in the busy hop garden, and watch the keen enjoyment depicted on the children's faces, especially on the "furreners," as the Londoners are called. Why there is freedom such as is only guessed at at home – birds whose songs are sweeter and whose plumage is brighter than any these young London arabs have ever seen in the bird fanciers' shop windows at home; and then in the intervals of work the very hedgerows yield their harvest of luscious blackberries, and no stern representatives of the law are there to insist on the everlasting "Move on now, move on !" so familiar to the town-bred ear of the young hop-picker. Ever and anon in the garden the waggon comes round to collect the pokes of hops and convey them to the oast house, where during the night, when all others are in the embrace of Morpheus, the drier will be drying and preparing them for being pressed into the pockets prior to their being dispatched to the hop factors in the Borough. To those who find pleasure in a country holiday, no season is so delightful as the autumn, and no district so charming as a Kentish hop district. Few of nature's kindly medicines are so beneficial to anyone who has run down and is out of tone as a week's frolic in a hop garden, and few more pleasant spots can be discovered for the centre of such a holiday than the quaint old town of Tonbridge. We must conclude this brief chapter by referring to a dreadful calamity which befel a party of hop-pickers in the neighbourhood of Tonbridge in 1853. It occurred at Hartlake Bridge, near Hadlow, about three miles from Tonbridge. one or two were reported to have been washed into trees by the side of the river, and were rescued next day. In one case only a boy survived, while father, mother, sisters and brothers were drowned. Many days elapsed before the bodies were recovered; and great difficulty was experienced in identifying them. Those who remember seeing the bodies afterwards laid out in barns, still speak of the great beauty of the dead gipsy girls. As soon as the disaster became known, all the gipsy tribes in the country flocked to the quiet Kent village where their dead friends lay, and the mourning was accompanied with the most heartrending demonstrations of grief. 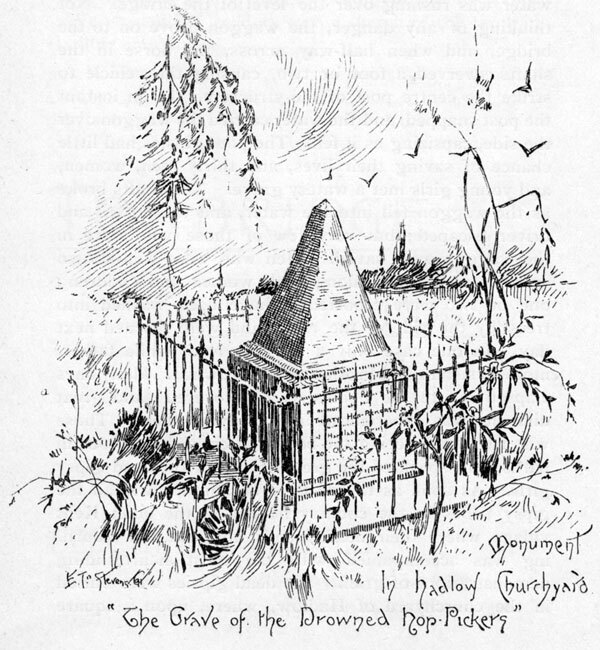 The dead gipsies were buried in the churchyard of Hadlow, where, upon a square pillar, there stands a small pyramid, erected to the memory of the unfortunate people. On one side are the following words:– "This monument was erected by Public Subscription in memory of the Thirty Hop-Pickers who were drowned at Hartlake Bridge in a flood of the river Medway, on the 20th of October, 1853, and whose bodies were buried in this churchyard." On the other side are the names of the victims. We present our readers with a sketch of the tomb in Hadlow churchyard. There are more pictures of hop-picking on this site here. Another extract from this book is here.